Once again, New Year’s Eve is dominated by fireworks and music. Ringing in the 2008 year you have the choice of music from Elton John, The Beatles, The Mamas and the Papas, or video clips from Richard Wilkins or The Chaser boys. TEN again has the Sydney Harbour fireworks, pitched very carefully as family friendly viewing. After last year’s debacle, this year it will be hosted by Kim Watkins and Andrew G, beginning at 8:30pm. 11:30pm is when the big three commercials switch their focus to midnight fireworks -depending on where you live. In Sydney, Nine appears to be sticking with its NYE Party Zone hosted by Richard Wilkins, unlike Seven. In Melbourne both Seven and Nine will air city fireworks over the Yarra and Federation Square. [Seven/8:00pm] The Beatles: Love. When THE BEATLES – whose music has cast its spell over generation after generation – came together with CIRQUE DU SOLEIL, few could have predicted the extraordinary adventure ahead. The aim was to attempt a visual interpretation of the magical landscape created by the Fab Four. Tonight, we follow the process by which the LOVE stage show and album were created side-by-side. Including the long-protected Beatles catalogue, unreleased archive material and exclusive interviews with SIR PAUL MCCARTNEY, RINGO STARR, YOKO ONO and OLIVIA HARRISON. [Seven/9:10pm] Help! – The Movie. (UK 1965) Digitally Resmastered. Step back in time with the Fab Four JOHN LENNON, PAUL MCCARTNEY, GEORGE HARRISON and RINGO STARR in this digitally remastered rock’n’roll movie classic that includes your favourite Beatles’ hits including ‘Help!,’ ‘Ticket To Ride,’ ‘You’ve Got To Hide Your Love Away’. When Ringo adds a new ring to his collection, he’s unaware of how important and dangerous this piece of jewellery is. Soon the boys from Liverpool are engaged in a slapstick and madcap chase round the world, as a crazed scientist, a pack of crooks, and several religious fanatics set out to capture the band. Also starring LEO MCKERN, ROY KINNEAR, ELEANOR BRON, VICTOR SPINETTI, JOHN BLUTHAL, PATRICK CARGILL and ALFIE BASS. [Seven/11:30pm] 2008 New Year Celebrations (Melb) Seven welcomes you into the New Year with a spectacular fireworks display from exclusive locations as we countdown to 2008! Plus, get a sneak peek at what’s coming up on your favourite network next year. Hosted by GEOFF ‘COXY’ COX, REBECCA MADDERN and MICHAEL FELGATE. [ABC/8:00pm] The Red Piano. Gregarious…astonishing…outlandish…and unforgettable. The musical wizardry of Elton John teams the glamour and glitz of Las Vegas together in the spectacular one-hour concert Elton John: The Red Piano, which screens on Monday, December 31 at 8pm. Exclusive to Caesars Palace, Las Vegas, Elton John creates music magic with his new show The Red Piano in the Colosseum. Working with renowned photographer and director David LaChappelle, The Red Piano takes the audience inside Elton’s world, juxtaposing his incredible music and performances against LaChapelle’s dazzling multi-media and special effects backdrop. The concert showcases the legendary artist’s unforgettable, greatest hits performances. This is the ultimate Las Vegas show starring rock ‘n’ roll’s ultimate entertainer! [ABC/10:50pm] California Dreamin’: The Songs Of The Mamas And The Papas. The story of 1960s pop group The Mamas and the Papas told through an examination of their hit songs. Through current and archival interviews, the members of the group tell their own story. [ABC/11:45pm] Rage. Programmed by The Chaser. [Nine/8:30pm] What a Year. Bert Newton & Julia Zemiro. [Nine/9:30pm] NYE Party Zone. Richard Wilkins hosts some of the biggest songs and hottest music clips. [Nine/11:30pm] Fireworks in the City. (Melb) Fireworks on the banks of the Yarra and Fed Square. Hosted by Rob Mills Georgi Quill. [Ten/8:30pm] New Year’s Eve 2007 – Family Fireworks. 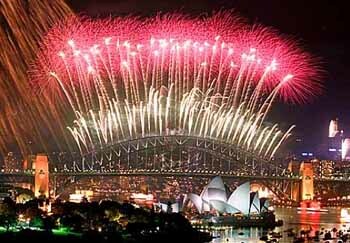 Sydney Harbour is the perfect place to be for the New Year’s Eve celebrations. Join hosts Kim Watkins and Andrew G for the pre-midnight family fireworks, and don’t miss special guest performances from some of Australia’s hottest acts, Pot Bellez, the Australian Idol finalists and ARIA winner Sarah Blasko. [Ten/9:30pm] Movie: Charlie’s Angels. Rpt. [Ten/11:30pm] New Year’s Eve 2007 – Midnight Fireworks. The countdown begins and Sydney Harbour is the perfect place to be for the New Year’s Eve celebrations. Join hosts Kim Watkins and Andrew G for the explosive celebration countdown into the new year. Also, Fuzzy from Video Hits joins us and performances will include, Amy Pearson and Natalie Gauci. [Seven/6:00am] The 118th Annual Rose Parade. The 30th Anniversary of “Star Wars” is the highlight of the 118th annual New Year’s Day Rose Parade from Pasadena California. Two-hundred 501st Legion Stormtroopers from 23 countries plus Darth Vader, and gorgeous movie-themed floats are all part of the celebration. Other features of the Parade include an opening production number with Broadway musical star KRISTEN CHENOWETH. [Nine/12:00pm] Movie: Can’t Stop the Music. Rpt. I wonder if anyone will take the plunge and have their fireworks in HD?